Killer is Dead sounds like it makes about as much sense as its predecessors. Goichi "Suda51" Suda's studio, Grasshopper Manufacture, has been very busy of late. It's released eight games in the past two years, and while none of those games have faired quite as well with critics as Killer 7 and No More Heroes, Lollipop Chainsaw is the studio's most commercially successful title to date. Grasshopper seems to be returning to its familiar, whacky-action stomping grounds with Killer is Dead, announced last April. 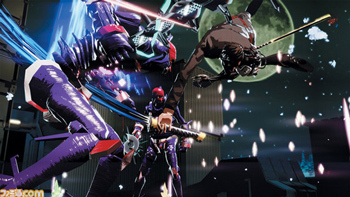 Details on the game have been sparse, but Suda has talked about the title in his column in Japanese gaming rag, Famitsu. "Development has already been ongoing for an extended period of time," he wrote. "It's the first game in the 'assassin' series that Grasshopper Manufacture has worked on in a while, a title that picks up where Killer7 and No More Heroes left off." In Killer is Dead, players take on the role of Mondo Zappa, a middle-aged bloke with a Mega Man-esque gun (which can also apparently transform into drills and other objects as you progress through the game) embedded in his left hand. Zappa receives a job offer from the Brian Execution Firm, which tasks our intrepid hero (or anti-hero as the case may be) with seeking out and murdering other assassins. In a cute nod to Killer 7, Zappa's gun/drill arm can absorb the blood of fallen enemies, letting him unleash special "Adrenalin Burst" sword strikes that can one-hit kill foes. As is seemingly traditional for Suda's games, it will also feature "high speed wrestling-like action." "It's the story of a man who doesn't show himself much in the public world," Suda continued, "but still worms his way into society and mercilessly eliminates the evil dispersed in it. It's a personal story, not one that's conscious of the chaos going on in the real world at the moment, but you might get more than a taste of that in the end anyway." Killer is Dead is scheduled for release this summer in Japan.